Yum is a very complete recipe manager. If you really like cooking, Yum will probably become one of your favorite programs. Thanks to this application you will be able to organize all your recipes in its brilliant interface to control each ingredient or step that you have to take. Adding any recipe to Yum is very simple, you will only have to indicate the name, the ingredients and the measuring unit, the people and the time necessary to finish each dish. What's more, organizing them by category (that each user will be able to create) will help you to manage each kind of dish. 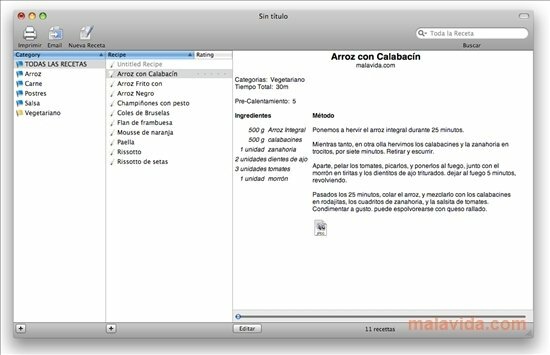 The application includes a complete search engine that will help you to quickly find the recipes, but even better still, Yum has an excellent viewer that will show each dish divided into steps on fullscreen, so that you can see it while cooking, and you don't only have to use it as a database. 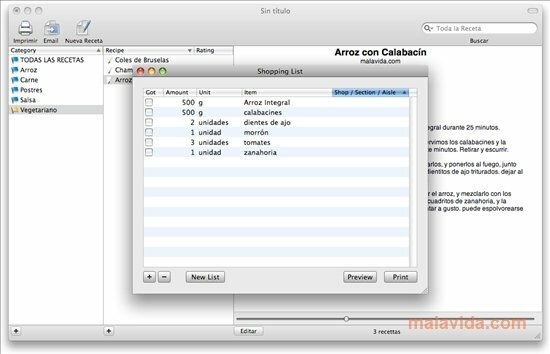 On the other hand, one of the most interesting functions is to create a shopping list. By simply indicating what recipe you want to cook, Yum will display a full shopping list that you will even be able to synchronize with your iPhone or iPod Touch.